1. The NY Times cites that only "91 contaminants are regulated by the Safe Water Drinking Act, yet more than 60,000 chemicals are used within the United States." Umm, kind of a big gap, wouldn't you say? 2. The EWG put out a comprehensive research analysis of the drinking water of a hundred cities with populations of 250,000 or more. My hometown ranks a measly 71 in the nation. Not exactly where I'd like to be. Perhaps I can use this as an excuse to move to Honolulu since they ranked a high 6th in the country! 3. The EWG also has a good step-by-step plan to buying the filter that's best for you. I personally use a Pur faucet filter. And when I had people come in and test my water, it turned out that my faucet filter was filtering out more than my expensive shower filter was. Go figure! Something else I've heard, but I don't have research to back it up--restaurants have to use a certain filter on their soda machines for the water they serve whereas bottled water companies do not have to follow as high of a standard. So many times it's safer (and more economical) to drink the restaurant's water instead of buying a bottle. That said, I've worked in the restaurant industry and have had to clean those machines. Umm, let's just say, I would also advise praying over your water, no matter what the source. For this week's (slightly delayed) Wednesday Walkthrough, I'd like to direct you to a friend of mine's incredible post "Why I'm on a Canned Food Strike." Camille says it better than I could've, and she's got great links to back up her stories. Very compelling and discouraging at the same time. I've got some Annie's meals in my cupboard now, and I'm not sure where I'm going to find tomatos, tomato sauce, etc. that's not in a can; but this definitely renews my determination to replace canned food as much as possible. Remember, baby steps. Don't get overwhelmed and not do anything. Take it one can at a time. Start with a doable goal...replace one canned item per week. You can do it! One of his sisters (pictured above with her three boys and husband) needs to send her three boys to live with Casey for a little while. Read all the details here, but as she clearly explains, it's a difficult but necessary decision right now. On top of that, Casey's wife is expecting her second baby the first week of April, so Casey is going from father of one to father of five within a couple of weeks. There's an address given in the blog where you can send Walmart and Target gift cards to help with the boys' expenses. This is another great opportunity to give toward the Haitian cause, knowing that your money is making an immediate difference. I'm going to stray a little from the beaten path today to challenge you in something that's been weighing heavily on my heart--charity. The earthquake in Haiti has made a greater impact on me than previous natural disasters in a distant land. Perhaps it's because I lived through the terror of hurricane Wilma (during my honeymoon, no less), so I've see how a large natural disaster can affect people, real people. Perhaps it's because of social media and the numerous status updates and tweets I've seen about Haiti. All of the sudden, what happened on the news became really personal when I saw how many of my friends had been to Haiti, had invested in Haiti, knew people or ministries in Haiti, etc. and had been affected. The world just got a little smaller. I've always heard that America is the most generous country, and even in our time of economic low points, I still believe we'll prove to be the most generous nation. Already I have heard so many different options for giving to help the people of Haiti; but giving to help in a time of natural disaster is not something that I have personally ever participated in. It always unnerved me to send an amount of money into the great unknown and hope that it actually landed somewhere that made a difference. And, of course, we all hear about the greedy people who take advantage of America's compassion and scam people of out money . . . so I have never given. But that changes now. 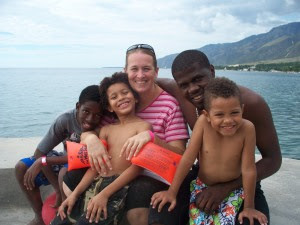 My friend from ORU, Casey, has family running a ministry down in Haiti. His status updates have given concrete facts about what is going on down there. For example, today he wrote: "My family takes care of 70 malnourished kids at a time. My sisters says food prices have doubled since yesterday. Many Haitian people didn't have enough money to eat before. It is a tough situation. Please continue to pray and give through whatever avenues possible." His sister who is in Haiti has a blog that she is updating frequently. Please check it out. Also, there is a PayPal button on the blog which allows you to give to help in their cause. For the first time in my life, I'm going to give to help a nation in need. And with my money goes my heartfelt prayers as well. I challenge you to do the same. Find a way to give. And if you're like me and haven't given before, make this your first time. New Year's always begs new resolutions, which in turn is quickly followed with eye-rolling, sighs, and insecure laughter as people create excuses for why they don't write goals. Well, as many a good man has advised, "If you aim at nothing, you'll hit it every time." I return to you, dear readers, refreshed from the long break, inspired to work with a greater fervor than before, and insistent upon challenging you to write down some goals for this year. Just the other day I attended a meeting where the speaker confessed that at one point in her writing career, she looked back on the previous year and realized that an entire year had gone by and she had not accomplished anything. I refuse to let you come to the end of 2010 and share the same sentiment. It is time to write some goals, post them in your home, and find an accountability partner to keep you on track. 1. Limit yourself to 3-5 goals max. Type-A's like myself scoff at this idea for there is so much that we are determined to acomplish in this one year, but I know, from experience, that writing 10 or 20 goals (or more--guilty!) is counterproductive. It does not mean that you will not accomplish the myriad of other challenges set before you; rather it will force you to prioritize, simplify, and make your list of goals a thing to be proud of, rather than, like my list from 2009, a paper I have conveniently lost and hope never to find. 3. Be realistic. You don't need to lasso the moon any time soon; just write a goal that gets you one or two steps closer to doing so--perhaps a goal to buy some rope and learn how to throw a lasso. The rope and physics needed to get to the moon can be dealt with a different year. Again, let me emphasize: Write down your goals, post them, and find someone to be accountable to. You CAN do this. What are you aiming for this year? Begin by sharing your goals in the comments section. Allow us to be a form of accountability to get you started in the right direction.